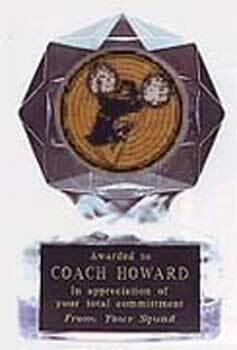 Cheerleader Ice Awards are a great way to acknowledge cheerleaders of all ages, without breaking the bank. 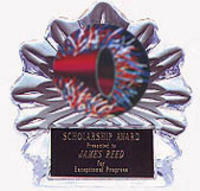 Cheer leading acrylic award trophies are available in three styles. The Star Ice and Flame Ice have two size options. The Block Ice has three size options, all have a good selection of cheerleader inserts. 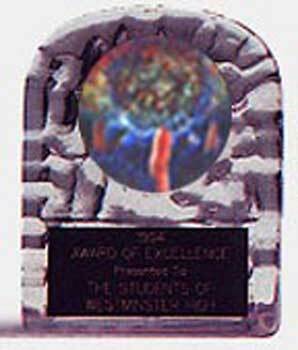 Our acrylic ice awards are designed to stand alone, they have a great look and feel. Very inexpensive trophies for cheer leading camps or school cheerleaders. Price includes your choice of color insert and 40 characters of free engraving. Extra engraving is only $.07 cents per character. Most orders a week from date of processing. We do offer a rush service and special shipping. When ordering it is always helpful to know the date of your award presentation. Please click on one of acrylic cheer leading awards below for more information and pricing. If you have any questions or need assistance in placing an order please call 1-800-787-8777. You may also send an email using the link at to bottom of this page.